Garfish also called Piper – Hyporhamphus ihi. This one is about 30cm in length which is an excellent size for eating. To cook simply gut, coat in flour and cook in butter. When fresh they also make excellent bait for snapper and many other target fish species. The garfish has an unusual appearance. It seems impossibly long and slender. Yet this little fish is a fast swimmer and puts up a good fight when caught on light line. It will often jump clear of the water when hooked it its efforts to escape. This characteristic leaping being a typical measure employed to escape kingfish, kahawai and barracouta that pursue it as prey. 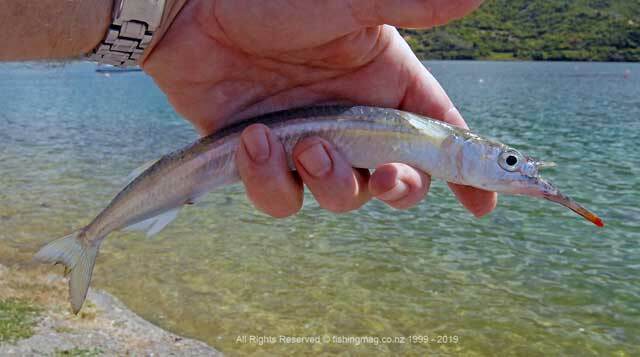 An average size garfish is about 200mm long though they sometimes reach twice that. The lower jaw has a long beak suggesting they are surface feeders. A brace of slender garfish shown with a Javelin lure designed to imitate them. Although garfish are widely distributed around New Zealand they are difficult to spot. They will mostly be seen swimming right near the surface but because they are so well camouflaged you might not see them. Their upper bodies are a greenish blue and silvery white underneath. However, they appear almost transparent when held up to the light. This colour scheme makes it difficult for both predatory fish to spot them from below, and seabird to see them from above. I have caught plenty of garfish in the Marlborough Sounds where they seem quite plentiful around Christmas time. They are attracted to the berley that we toss on the water for yellow-eyed mullet. Though they tend to hang back a bit further than mullet, the bread berley will help hold them in the area. I is best to keep tossing cupfuls of berley across the water to keep them in the area where you are fishing. Berley is the secret of success when fishing for garfish. Garfish float rigs are designed to present your small baited hooks just beneath the surface. Garfish have small mouths so it is essential to fish for them with equally small hooks. Size 10 – 12 with a barbed shank are best because they hold the small bits of bait well. I tend to use whatever bait I have available. Usually, a bit of fresh mussel from one of the rocks I am fishing off does the trick. Certainly, the very best bait would be something wiggling such as a yabbie or a maggot! But they will take the cut baits just as happily. A light float rig is by far the best to catch them on. Remember they are just below the surface swimming together in schools. So you want to have your hooks just break through the surface tension of the water. Use light line such as 6 lb mono. The job can be a bit fiddly but well worth the effort. Tie your rigs at home and store them by wrapping around a bit of cardboard and place in a plastic bag. This is by far the best way of doing it. No time wasting when the fish are biting. A small bubble float that you squeeze to let in a little water for casting weight is good, or an old wine bottle cork will do just fine. 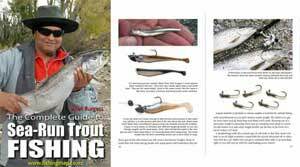 I catch them on lightweight trout spinning gear which is a lot of fun for the kids and the adults alike. Garfish are good to eat but you have to avoid the fine little bones. Interestingly if you go out on deck at night when your launch is moored in a sheltered bay and shine a strong light onto the water garfish seem drawn to it. Then you can scoop them up if you have a fine mesh net available. Stored in a bucket they make excellent bait for snapper and other species. Garfish respond well to berley which brings them around your hooks from far and wide. They aren’t as aggressive on your small baits as other species like spotties and mullet so when you get large numbers of mixed baitfish beneath your boat, or under the jetty, picking out the garfish can be a challenge. Size 8 or 10 hooks work well as they only have small mouths. I find a very small squid bait is the go as it is a little harder for other fish to steal as soon as it hits the water. This fine catch of garfish will make excellent bait for surfcasting or boat fishing.